(Photo: REUTERS / Ian Waldie)Radical Muslim cleric Sheikh Abu Hamza al-Masri addresses the sixthannual rally for Islam in Trafalgar Square, London, August 25, 2002. 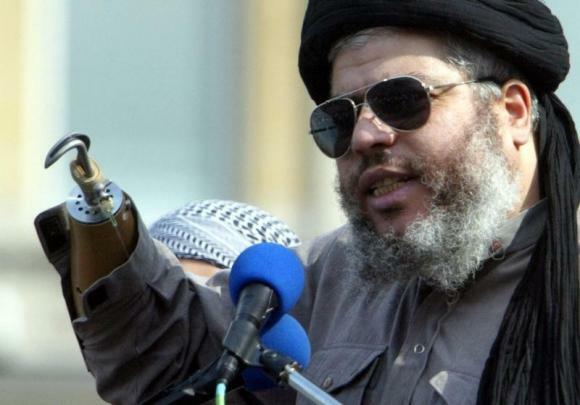 NEW YORK, May 12 (Reuters) - London imam Abu Hamza admitted to a U.S. jury on Monday that he provided a satellite phone to Yemeni militants months before they kidnapped Western tourists in 1998 and spoke to their leader just three hours after the hostages were taken. But he insisted under questioning from his attorney that he did not know about the kidnapping beforehand and said he felt "betrayed" when he learned about it. "Innocent people are not to be touched," he said at his trial in New York on terrorism charges. "You can see this in my preaching." U.S. prosecutors have accused the one-eyed, handless imam of helping the militants, as well as dispatching two men to Oregon to set up a jihadist training camp and sending followers and money to Afghanistan to help al Qaeda and the Taliban. The Egyptian-born Abu Hamza, 56, finished two days of testimony on Monday by acknowledging he had used inflammatory language in his sermons but rejected any suggestion that he had committed a crime. Government lawyers will have their chance to cross-examine him on Tuesday. During Monday's testimony, Abu Hamza said he acted as a "mouthpiece" for a group of Yemeni rebels seeking to overthrow the government but had no idea they planned to take hostages. When he received a call from the militants' leader, Abu Hassan, three hours after the kidnapping, Abu Hamza said he offered to negotiate on the militants' behalf. He said he purchased additional minutes for the phone to allow the hostages to contact their families. "I am at war with the Yemeni government," he said. "But this is not the way to conduct a war." The jurors heard last week from two of the hostages, including Mary Quin, who interviewed Abu Hamza in London years later. During their recorded conversation, the imam said the kidnapping was "Islamically" justified. Abu Hamza's lawyer, Joshua Dratel, also asked him on Monday about a comment he made last week, when he said he "loved" former al Qaeda leader Osama bin Laden. Abu Hamza said that the "undisciplined" bin Laden caused Afghanis a lot of pain with his tactics. "I've held him accountable for that," he said. Abu Hamza testified last week that he lost his hands and eye in an accidental explosion in Pakistan two decades ago, though British officials claim he was injured while fighting Soviet troops in Afghanistan with the mujahideen. Prosecutors have shown the jury numerous taped incendiary statements from Abu Hamza, including one in which he praised the Sept. 11, 2001, attacks that killed nearly 3,000 people in the United States. In a nod to those speeches, Dratel noted on Monday that he had used a lot of "harsh language" and said, "You've been a pain in the neck." "A squeaky wheel," Abu Hamza replied. But, Dratel asked, had Abu Hamza ever committed any of the crimes with which he is charged?